It took almost 25 years but my set in now complete. I am talking about my custom made kitchen knives made by Bob Kramer. Bob Kramer is a Master Bladesmith who is very respected by Chef's and knife enthusiasts worldwide. To obtain a knife by Bob is almost impossible and are coveted by many. I have been collecting his knives one at a time for a long time. I have been on his elite knife list for approximately 25 years. We met Bob and toured his facility when he was located in Seattle. This roasting fork will completed my set. Christmas arrived a weak early this year. When I placed the order for this fork several years ago, I wanted it made in stainless steal. Bob has been making masterpieces in Damascus steel lately and decided to upgrade my order at no additional cost for my patience in waiting for this special order. What is Damascus steel you may ask? This is from Bob Kramers web site; "Bob's custom Damascus, also known as 'pattern welded steel', is the result of combining at least two different types of steel that harden and temper in the same range to achieve a desired aesthetic. Damascus has a complex creation process and requires lots of time and concentration; it constantly allows me to tap into my creativity to produce a unique art piece that is also a high performance tool for your kitchen." My roasting fork arrived last week as a sort of pre Christmas surprise. What a beauty. 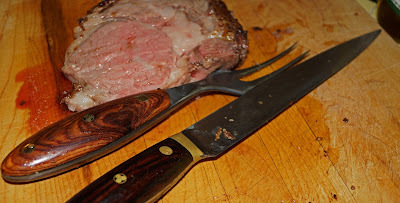 We gave it a test run yesterday using it to carve the Christmas Prime Rib Roast. It worked like a charm and was a beautiful tool to look at as an added bonus. Needless to say I am very happy to have a complete Bob Kramer knifes set. It was worth the wait.